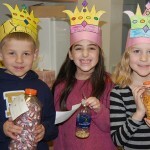 Friday, February 3 marked the 100th day of classes for the 2011-2012 school year. 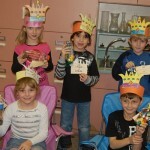 To celebrate the day, Miss Weber’s and Mrs. Walkowiak’s first grade classes at Conestoga Elementary made 100th day crowns. In addition, each student collected 100 objects and placed them in a bottle. The students then wrote three clues to identify the objects and their classmates guessed before the contents were revealed. Some of the objects included pennies, goldfish crackers, popcorn kernels, legos, red hearts, and mints. Only 81 more days to go!